The large, attractive and just all round incredible, 12′ x 8′ Windsor All-Purpose Shiplap Pent Shed makes a first impression unlike any other shed. This is because of its huge size and very impressive design. The walls have a very sleek and smooth look to them, making this something that really is going to stand and look great in your garden. 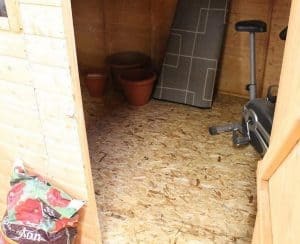 The amount of space inside the shed is just incredible and will allow you to use this for a number of uses ranging from general storage of items that are cluttering up the house and garden to being an actual workshop. 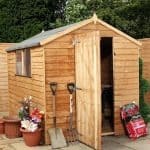 This is a shed that has a very friendly and inviting appearance, this is because of the lovely looking door and wide windows which you can actually choose where they are placed on the front of the shed. 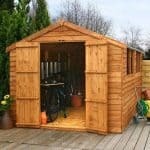 High quality materials and clever design makes this a shed which is going to be with you for a lot of years. 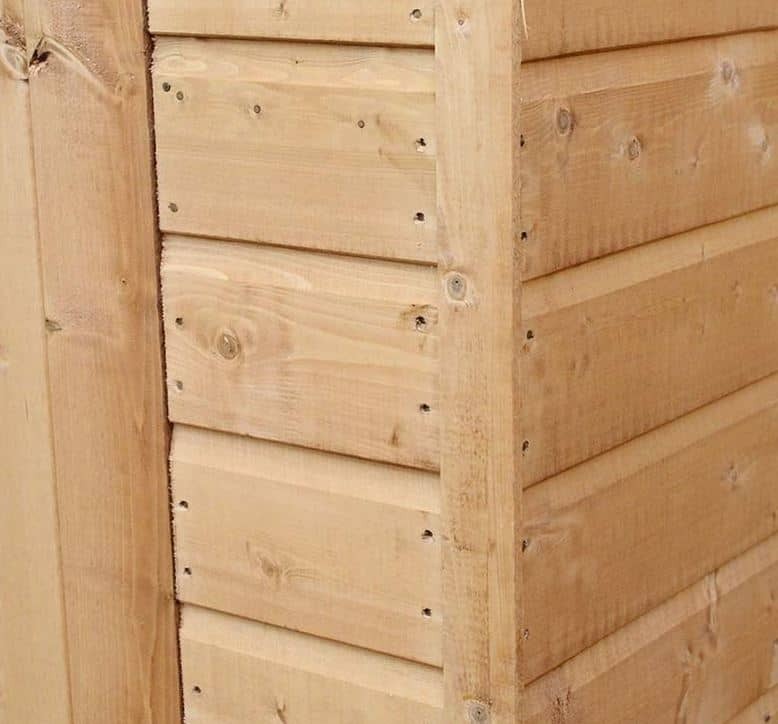 The walls are 12 mm tongue and groove shiplap cladding and the frame behind this is far more robust than you would expect from a shed at this price. The pent roof will keep your items well protected from the weather and the flooring has been backed up with some very strong, pressure treated floor joists. The 12′ x 8′ Windsor All-Purpose Shiplap Pent Shed is the largest shed in this line from Windsor. It has a very impressive look because of its huge size and fantastic design. The room available to you inside here is just staggering with the width being, 11 feet 9 inches and the depth, 7 feet 6 inches. This vast amount of space allows you to really get creative with the way you store things. One thing that we were very happy with was the headroom that is inside here. 6 feet 8 inches is the highest point of the shed and 5 feet 7 inches is the lowest, this we feel is more than enough. The solid sheet boarding which has been used for the pent roof is 8 mm thick which is what we would expect from a shed in this price range. This type of boarding may lack the good looks of say, tongue and groove boarding, but it does its job very well and they also help keep the cost of the shed down. Covering the boards is roofing felt which is going to protect the boards and your items inside from rain and actually the boards will be able to take the weight of a lot of snow so the roof is very well weather protected. 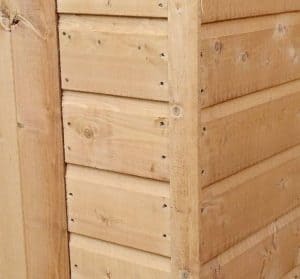 This is one very smooth and high quality looking shed and that is because of the 12 mm thick, shiplap cladding that has been used for the walls. 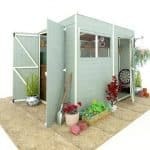 We really do love the look of this shed as it has such a classy and elegant look to it that will make it really stand out in your garden. This type of cladding has been very well made by the fine folks at Windsor and it is not going to allow any rain inside, all the while looking awesome in the process. Behind those walls there is a very robust frame, actually the frame which has been used in this series of sheds is far more sturdy than we thought it would be given the price range. It is 28 mm x 28 mm and it really does make this one very secure and strong shed that is going to be able to take quite a bit of punishment over the years from the weather, the kids and even you giving it the odd bash with the mower as you are cutting the grass. In all this frame really does make this one very impressively strong structure. Solid sheet boarding is what you will be walking on and placing your items on top of. Look we know this is not the most high quality floor in the world and while we would have loved to have seen some tongue and groove boarding, we understand the financial and design choice of selecting this floor. This is not to say this is a bad floor, far from it. You see this flooring is very strong in its own right, but Windsor have also used pressure treated floor joists which as well as allowing you to store many heavy items, lifts the floor off the ground. Windsor always give their sheds a generous coating of wood treatment, but this is just for short term protection. It will be fine during construction and perhaps even for a couple of weeks after, but you will want to give it a good coating of wood treatment shortly after you have built it. We must also tell you that annual treatment is required to make sure the wood stays strong and free from rot. Like they do with the rest of their sheds, Windsor give you a ten year, anti rot guarantee with this shed. The 12′ x 8′ Windsor All-Purpose Shiplap Pent Shed has a really impressive door that has a very nice look to it and is also incredibly strong and reliable. Kept in its place with top quality door hinges, the door is single braced and it is not going to start sagging on you after a few months as it is made so well. The dimensions of the door will make getting yourself and your belongings in and out easy. The height of the door is, 5 feet 5 inches and the width, 2 feet 4 inches. There is one large window on the shed which is a very interesting size it is also made from anti shatter styrene which if you have kids is going to be something you greatly appreciate. We feel that the size of this window is going to allow for plenty of natural light to get inside the shed. The door will be kept tightly shut thanks to the pad bolt, but there is no actual locking mechanism included with the shed which is something we really would have liked to have seen included. You will have to buy a padlock to add to the pad bolt. This is not a huge expense to be honest, but it still would have been preferable for Windsor to include one with the shed. This is one of the best looking sheds that we have seen from Windsor, but it does lack privacy thanks to that gorgeous looking large window. We feel that if this is something which is going to bother you because you plan on storing expensive things or perhaps even, you will be thinking about working inside here then a set of blinds would give you the privacy you desire. By using coloured wood treatment, you are ensuring the wood stays protected, but also that you are giving the shed a little bit of personality. There are a number of different colours out there for you to choose from so have a little fun by making the shed a colour you like. Also when you are building the shed, you can place the door and the panel with the window on it on any location on the front which is something we think is really cool about this shed. Windsor do not really offer any hidden extras with this shed which we appreciate, but you will have to buy a padlock if you want to be able to lock up the shed. The only thing they offer is their own installation service which is a very pricy, £319.99. For the most part (and especially considering the price) this is one very high quality shed which genuinely surprised us with some of the materials that were used. 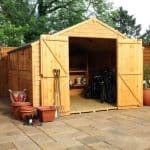 A yearly coating of treatment is required to keep the shed strong and looking amazing, but this is not a huge amount of effort and if you do this, we are confident that this shed is going to be something that you can use for at least a couple of decades. 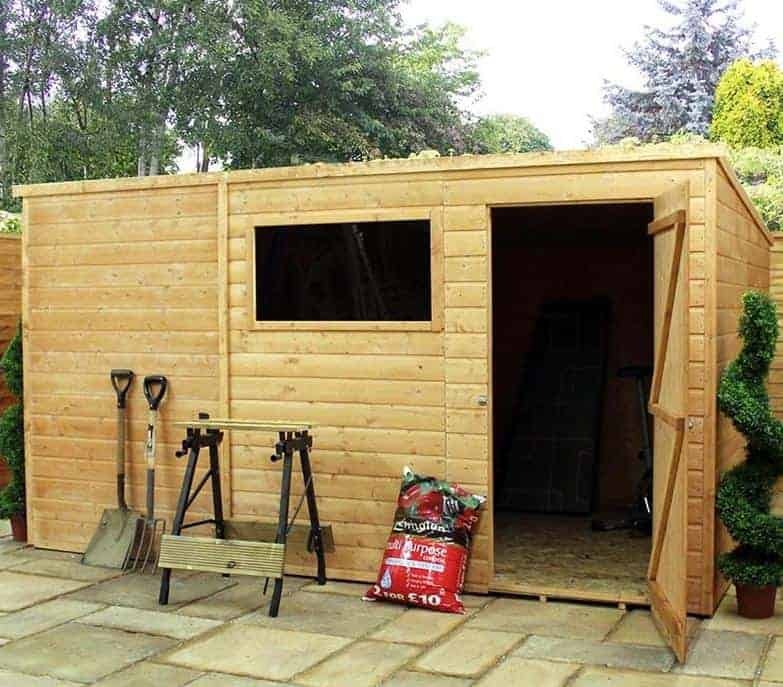 This shed really is huge and we are sure if lots of storage space is what you require or even your own little private workspace that you will have more than enough room. A large shed is always going to be a little on the tricky side to build and you will need a friend to help you. However, following the instructions, taking your time and trying to enjoy it will make it a more pleasurable experience all around. Windsor say that it should take you around 4-5 hours to build and this is what we would expect. 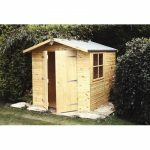 For the low price, you really are getting a huge shed that is made with top quality materials. Final Thoughts: We have seen many sheds from Windsor, but the huge, 12' x 8' Windsor All-Purpose Shiplap Pent Shed is one of the most impressive. It has just such an epic presence that we have no doubts you are going to love it. The price of £699.99 makes this one of the lowest priced, large sized sheds out there and this is what we feel is going to make this a huge seller for Windsor. 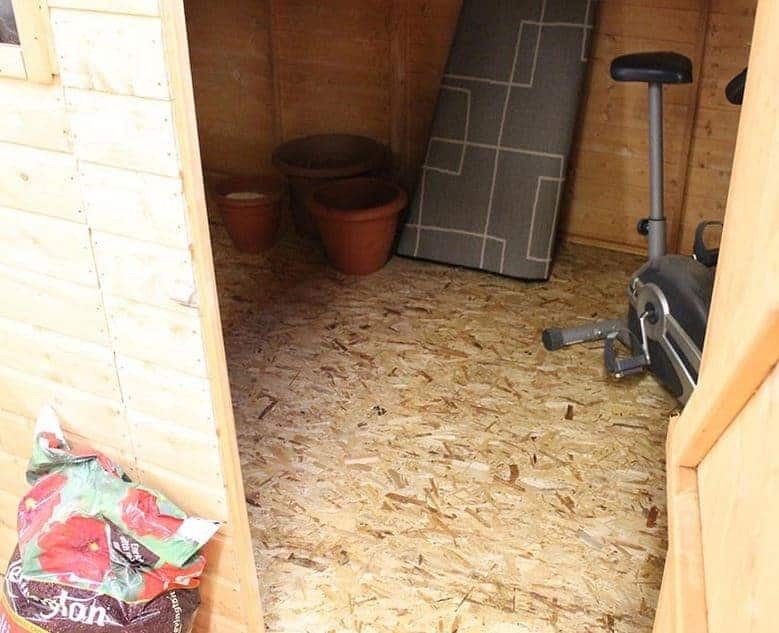 If you are a person who loves to do DIY and who enjoys pottering around the garden and has more tools than B&Q, you will be happy with this shed. Also for a family that is sick and tired of tripping over bikes, footballs and has more toys in the house than the local toy store, you will also find this shed amazing. 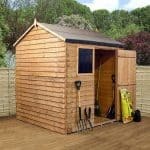 If you are in the need for lots of storage space then this is a shed we highly recommend.